We’re building with concrete, for a number of reasons. It is strong, it can survive hurricanes and tornadoes, it is thick, giving us the wall thickness we desire, but also it is incredibly energy efficient, and I wanted to build an energy efficient castle. Concrete has immense thermal mass which allows it to only slowly transfer heat. It actually works very well for a home since it takes so long for the walls to warm up and transfer heat, it takes all day, then they give the heat back during the night. Concrete walls are pretty much more energy efficient than any other wall type. But we’re not even using regular old concrete, we plan to use ICFs, which are insulated concrete forms. Normally when forming a concrete wall wooden forms are put up and the concrete is poured in, it hardens, and the forms are removed. With ICFs the forms are premade with foam, the concrete is poured in, but the forms are then left in place. This gives you a moisture/insulating layer of foam, then concrete, then more foam. 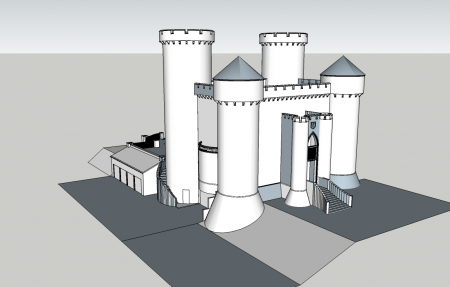 In our castle it’ll be an inch of stone, half inch of mortar, 2 inches of foam, 6 inches of concrete, two more inches of foam, half inch of mortar, and another inch of stone, making for a fairly thick wall, and incredibly energy efficient. Essentially it makes the whole house a double walled cooler. For heat we plan to use a geothermal heat pump with radiant in floor heating on the first floor, which should be enough to heat the entire building as the heat rises. Our location is too remote for gas and geothermal is the most efficient electrical powered heating form I know. You essentially use the heat of the earth, which is a constant 55 degrees, running through various heat exchangers to heat or cool your house seasonally, the one system can do both (though, ducts will be required for cooling). As far as energy uses go, it is very efficient, the most efficient heating method I know other than passive solar. As far as cooling goes, I hope we don’t need much, by limiting windows, and having high ceilings, I think it’ll stay quite cool on the inside. When I visited Rome it was sweltering outside, yet stepping in St. Peters Basilica or the Parthenon it was always cooler, even though windows and doors were open, just being inside a large stone structure made it cooler. Also our main skylight, which runs the center of the house, will be operable, allowing hot air to escape automatically in the summer in what is known as a solar chimney. The skylight also provides ample natural light hopefully limiting the need for lights during the day in a house with this few windows. The roof, being largely flat and hidden from prying eyes by the battlements, becomes an excellent place for a solar array, as pictured. I want to cram as many panels as possible on to the roof, as budget and space allows. In my ideal world we’ll be a net 0 (no net energy use) castle, but we’ll see how things turn out. I have thought for some time, because of the height, that rooftop mounted wind might work as well, but as near as I can tell that technology just doesn’t seem to work well. Buildings can’t support turbines of any appreciable size because of vibrations and wind load and all these other things. We can leave the option open for the future. 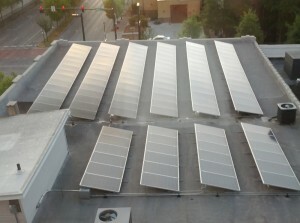 We hope to heat the pool as much as possible through solar thermal heat as well. Much of the surrounding land will be used for home food production, which doesn’t necessarily make the building more energy efficient, but our lives will be. Please email me, I too have designed an icf castle. It would be nice to discuss the technical issues that I see. i am not sure how they did the roof on many castles ? I tried emailing you Brian but it came back undeliverable. I was reading what you are doing and am inspired. I have a few places here in Michigan that I’d love to build a castle. Might there be any chance you can share your floor plans? I’m looking for design inspirations at this point to start doing some long-term planning. I too have been planning to build and ICF Castle here in Oregon with battlements and a torret my castle will be very small only a 20 by 28 garage apartment size with a 28 by 10 simi en losed Deck on the side but it will be three stories tall with battlements on the top. the concrete floors will be heated by radiant underfloor heat and an electric tankless water heater it will also heat buy water for plumbing I will have one Mini Split heater air conditioning unit installed which should be plenty of instant warmth as the radiant heat is slow and takes a while to warm up.. here in Oregon we don’t need so much a/c but it is nice to have on the few hot days in summer.. my plan is simple and cost effective without any frills or extra expense . But planning to leave the door open for stone veneer and heavy wood doors to be added later. I would love to share my plans if you wish .